Whether it’s retail, healthcare, government, or education, we pride ourselves on delivering powerful, cost-effective BI solutions for your specific business. Automate Financial and Operational Reports with a solution that is flexible enough to also handle your Regulatory Reports, Budgets, and Dashboards. Simple GL, Loan, Deposit, and Customers extracts is all you need to get started. Create financial reports, operational reports, regulatory reports, and budget & forecast templates with simple general ledger, loan, deposit, and customer extracts into BI360 for Credit Unions’ data warehouse and report writer. See how we’re driving Performance Management initiatives for budgeting, forecasting, reporting, analysis, dashboards, and data warehousing at higher education institutions today. As federal, state and local governments look for powerful BI solutions to drive performance and reduce costs, Solver’s planning, budgeting, reporting, dashboards and data warehouse modules are proving to be invaluable tools. With BI360, healthcare providers can better manage their performance through user-friendly planning, budgeting, reporting, dashboard and data warehouse tools running on a cost-efficient Microsoft platform. Discover powerful reporting, budgeting and more for Hotels, Restaurants, Casinos. 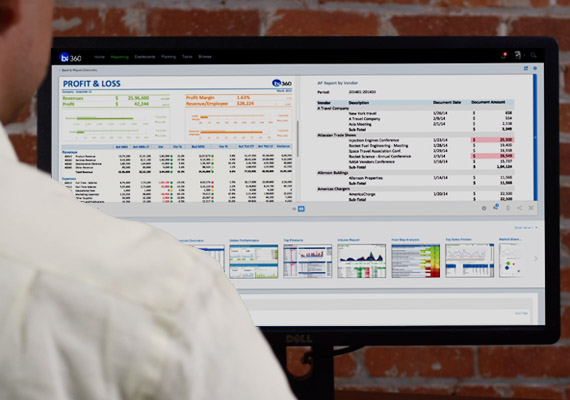 Improve cost control and performance with a complete BI suite to help manage budgets, financials and metrics for monthly reporting, sales, marketing programs, and claims. See how BI360 helps organizations specific to manufacturing to help you focus on what matters: growth and strategy. We share our best practices to help you focus on what matters: growth and strategy. Explore how to automate your budget process, as well as quickly report and analyze by important business areas, such as departments, programs, projects, grants, and membership and track the impact and progress of your initiatives. Drive progress with fully integrated reporting, budgeting and dashboards to monitor and plan for financials, sales, drug trials, reimbursement programs, and patient assistance. Use BI360 to plan and control all aspects of your professional services operations, including monthly financial reporting, as well as operational reporting, budgeting and dashboards for projects, clients, professional staff and consultants. Improve performance and visibility across real estate offices with reporting, budgeting and dashboards to measure and analyze real estate projects, agent and regional sales, stock, and partnerships with financial institutions. See how BI360 helps retail organizations with geographically dispersed locations and online sales consolidate, view and understand their data to deliver better financial and forecasting insight. Hit a homerun with BI360! We share our best practices to help you focus on what matters: growth and strategy.